i need to know so much. have you ever seen so much EYEWEAR in your life? TRY IT SOMEWHERE ELSE, HARMFUL UV RAYS. the LAYERS. the PATTERNS. so many ACCESSORIES. perhaps making a love lockdown inspired line. 3. being "red" in a world of "grey"
5. the movie "white chicks"
also: the genius of ace of base's "the sign"
"How to REALLY screw up your last SNL performance"
"the proper way to clean your Louis Vuitton underwear"
"how Karl really has no eyes. the glasses are pretty important..."
I cant even follow that up... i got nothin. (1) favorite song from "Rent"
(2) which soundtrack of "Rent" is better: Original Cast Recording or Motion Picture Recording. this is really hilarious:) love the blog! HA! Love it. 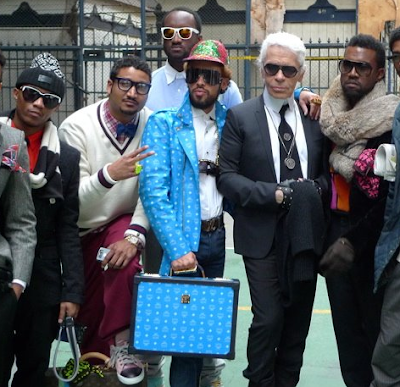 I saw a pic of "Kanye's Posse" somewhere else too, not with Karl though! Priceless. I wonder if they bond over a mutual dislike for shedding animal hair and small children? Lol that was a funny post. love it. They must surely be talking about sunglasses too right? I feel like they're trying to out accessorize one another. Do you think they read Hypebeast and Selectism?